CARTIER REF. 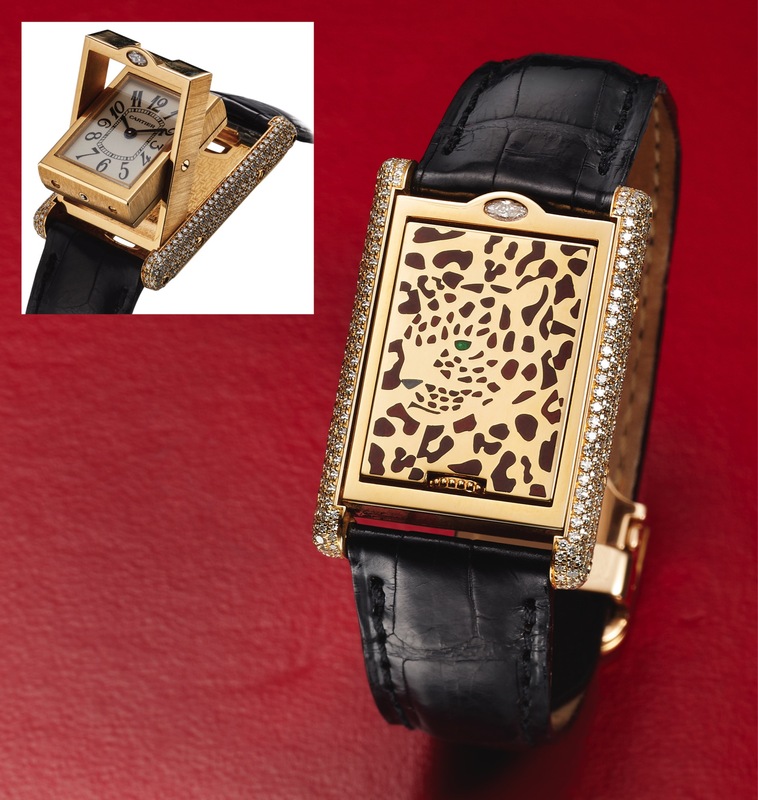 2480 BASCULANTE DIAMOND AND YELLOW GOLD Cartier Paris, Réversible Basculante, No. 18 / 20, Ref. 2480. Made in a limited edition of 20 pieces in 2001. Fine and rare, 18K yellow gold and diamond quartz wristwatch with cabriolet pivoting system and an 18K gold Cartier deployant clasp. Accompanied by the original fitted box, certificate and booklets. Four-body, solid, polished and brushed, bezel, sides and lugs pave- set with round diamonds, oval cabochon diamond at 12, rounded lugs, engraved Cartier logos decoration inside the outer case, sapphire crystal. Ivory color with painted radial Breguet numerals, inner minute track, on the reverse a mosaic enamel decoration depicting a panther. Blue steel epée hands. With quartz standardization. C. Four-body, solid, polished and brushed, bezel, sides and lugs pave- set with round diamonds, oval cabochon diamond at 12, rounded lugs, engraved Cartier logos decoration inside the outer case, sapphire crystal. D. Ivory color with painted radial Breguet numerals, inner minute track, on the reverse a mosaic enamel decoration depicting a panther. Blue steel epée hands. Dial, case and movement signed. DIM. 22 x 32 mm. THICKNESS 7 mm.